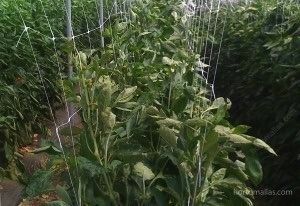 Trellis Netting used as Vegetable Crop Support, increases Yields and reduces Plant Stress and Pathogens. HORTOMALLAS trellis netting will provides so many advantages against the usual and traditional raffia twine support system. Plants will develop fully on a mesh net as compared to how much they can grow on a single string of raffia twine. Also aeration will improve as the leaves will be better and more efficiently exposed to the sun. Plants trellised on HORTOMALLAS net will not need to be touched as much to be guided and trained upwards as with other plant training methods. As we will discuss below, the less a plant is touched the more profitable the crop will be. 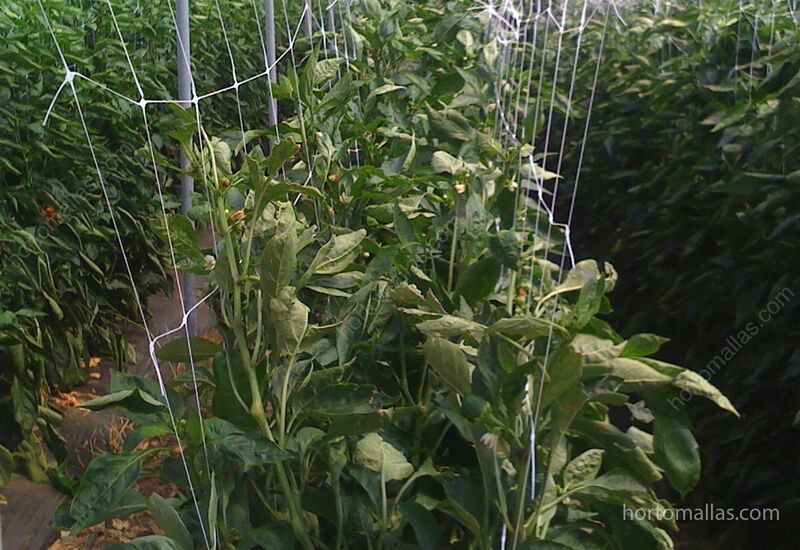 An example of how to train peppers using a double wall of HORTOMALLAS trellis net system. 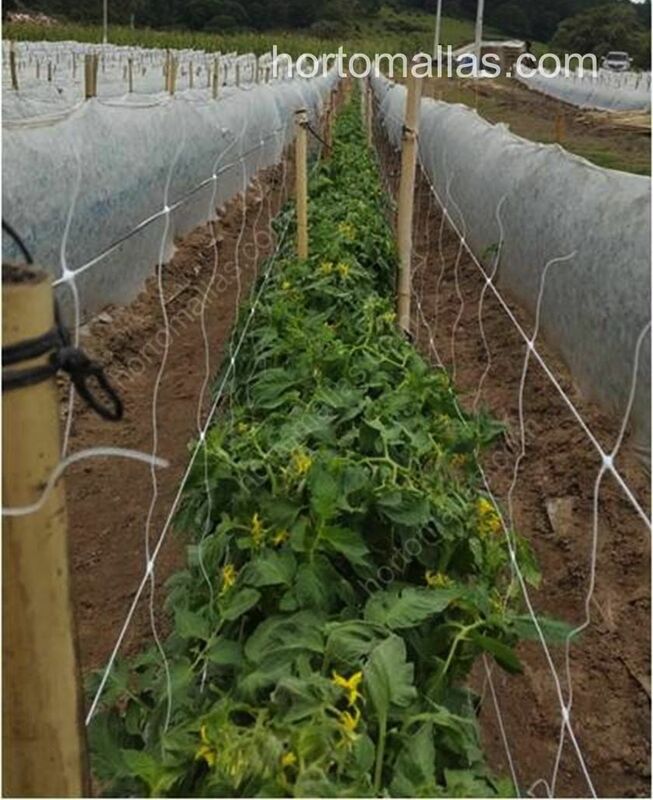 HORTOMALLAS installed in a double wall of trellises with nets manner will enhance the plant´s natural tendency to lean on a support system without needing to be guided as much as in traditional raffia twine systems. 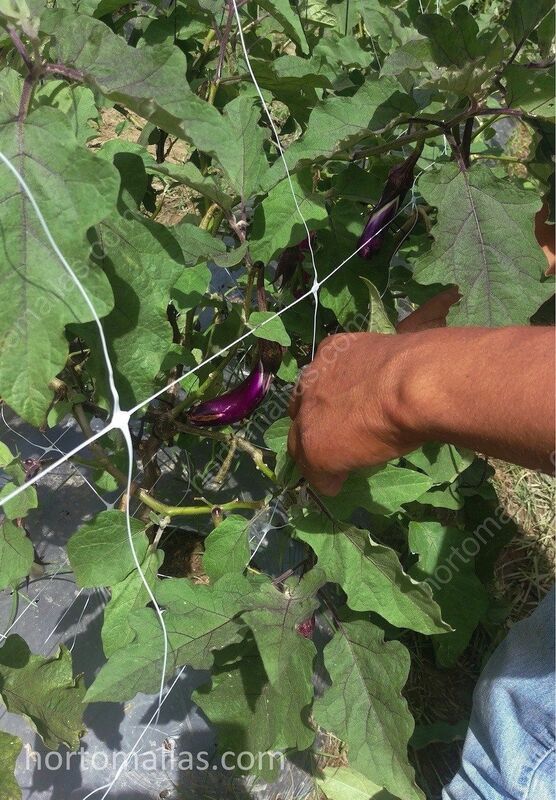 HORTOMALLAS offers the technological alternative to increase production by simply tutoring crops vertically with the aid of a simple plastic net. 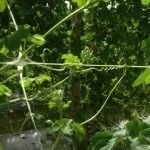 Especially when it comes to cucurbits, like cucumbers and bitter and sweet melons, with their tendrils that do the climbing work, modern farming techniques will improve yields by reducing the amount of labor required to tend manually agricultural twine as a support trellis. By using a ready made net instead of doing the weaving by hand, one reduces plant stress and disease transmission, and this in turn will increase the tonnage produced, with less chemicals and labor and achieving higher quality in the crops that will be better paid at the time bringing your fruits to market. Try to combine HORTOMALLAS trellis netting with INVERNAVELO horticultural fleece for even better results and early harvesting. 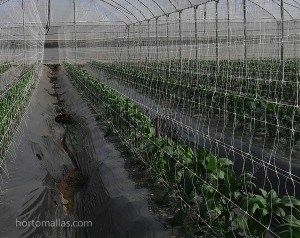 An example of a double walled trellis netting by HORTOMALLAS inside a greenhouse with bell peppers. Trellis Support Netting reduces the mechanical transmission of diseases. By reducing physical (mechanical) contact with the field operators (besides reducing labor costs) you will reduce pathogens substantially, as virus and fungal contagions from plant to plant due to the actions of laborers will be eliminated since the net substitutes the manual training of the vegetable plant. Let´s remember that besides white flies and thrips, also the hands of the workers can become very harmful vectors of disease transmission. 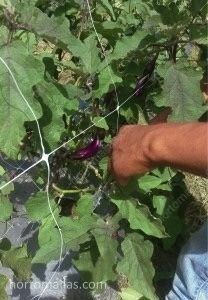 HORTOMALLAS trellis netting used as horticulture support net training eggplant, here during pruning. Why is mechanical stress an important factor when trellising plants? Also introducing trellis net as a vegetable support system will reduce the handling of plants otherwise necessary during the manual tutoring using a raffia twine, and thus will reduce the mechanical stress to the plant, condition under which the plant stops producing fruits weight in order to re-establish its proper orientation towards the sun. HORTOMALLAS trellis netting will increase tomato production even under low tech greenhouses, by reducing mechanical transmission of diseases. We have a study available that shows how mechanical stress from workers handling reduces crop yields by 8 to 10%. The explanation is very simple, plants are very efficient organisms: each leaf is turning towards the sun in order to maximize solar exposure. By having to handle plants and their leaf systems manually during plant training and tutoring, we are changing the orientation of the leaves stressing its natural functioning, thereby forcing the plant to draw from and use its energy reserves to rearrange the leaves towards the sun again. These 4-7 days needed to redirect leaves are days that the plant stops filling fruits. As the plant stops working at peak performance we are effectively reducing production by at least 1/10. 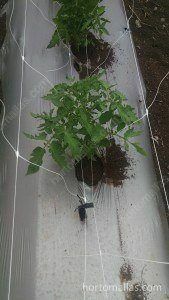 Using a double walled trellising net on the contrary, avoids these losses. If you are interested in this study, please send us an e-mail and we will gladly forward it to you. If you would like to see trellis netting on video, please follow this HORTOMALLAS link. Double wall HORTOMALLAS system training tomatoes. The trellising net from both sides of the plant is tied at the foot of the young plant, so it will not lean over as it grows. Double Wall Trellising System ideal for Solanaceas. 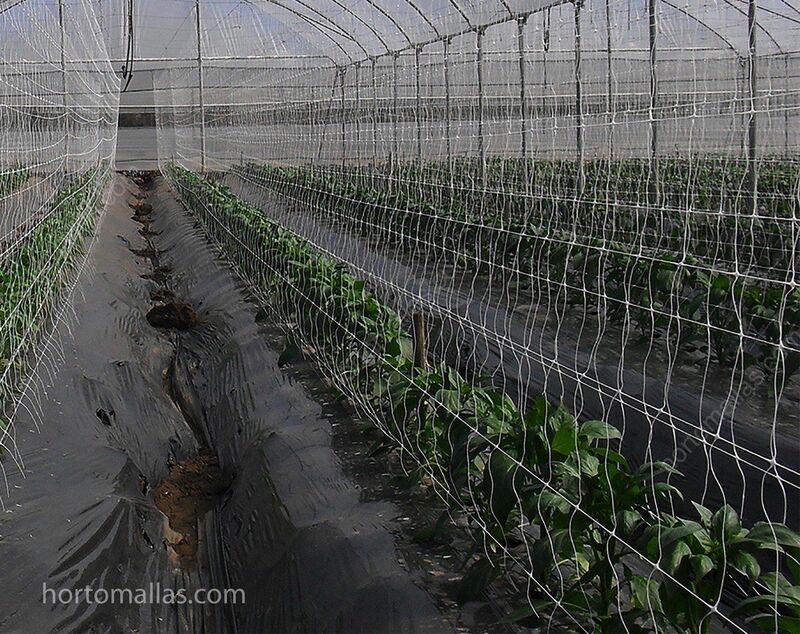 In the double wall system of installing trellis netting it is important to note that the two sides of HORTOMALLAS net installed on each side of the plants´row must be slightly tightened at the bottom or foot of the plant. This is done since when the recently transplanted plant from the nursery tray into the soil or growing medium (in case of a hydroponic crop), needs a little bit of extra attention and support. As the plant grows upwards and thickens in order to support more weight the SCROG netting is allowed to open up and increase in distance as to support a wider and larger plant.